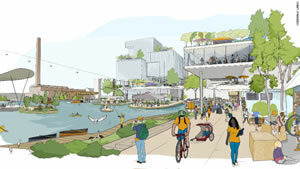 Matt McFarland for CNN Money: Sidewalk Labs, an urban innovation company owned by Google's parent company Alphabet, is teaming with Toronto to begin planning a neighborhood designed as a model for urban life in the 21st century. Sidewalk Labs will invest $50 million in an initial phase of planning and pilot testing. Alphabet has also pledged to relocate Google's headquarters in Canada to the new neighborhood, called Quayside, which is on the Toronto waterfront. Google has roughly 1,000 employees in Canada. Sidewalk Labs plans to do everything from reduce pollution, commute times and landfill waste to improve the weather. It envisions reducing the impact of wind, increasing shade on sunny days and blocking rain due to smart building design and tree planting.